For a standard 3.2 tony is there any Preformance boost in fitting a pink higher flow or extreme...or upgrade to a blue one? When tuned for power we all crave for, yes. Standard, much more reliable and deliver smother power compared to tired unit. How would a hi flo or extreme unit go! More extreme stuff coming out soon. Yeah but what do you think Tony? I love cats, but I couldn't eat a full one! Surely you wouldn't get far before you'd hit the pump's limitations? Which would be why Geek goes through them at a rate of knots. I suspect we're up against the thin end of the wedge here. I can see modified fuel pumps, bigger injectors and so on and so forth on the road ahead. Then we're going to need upgrades to our gearboxes and transmissions to cope. my SCV has strted working again. ag9111 wrote: my SCV has strted working again. mate i took my MN in last week and it drove perfectly to the dealers but i told them i suspected what it was and they managed to 'get it to play up'. so it is going in for warranty next week. i think they get them hot to play up. my MN was really bad in the hot weather and settled a bit recently and is more sporadic than permanent. in any case they did not have a new valve available for over 24 hours so i have to take the car back. have you had it tested yet? or are you taking it up for assessment? they wont be able to fix it same day unless they sit on stock and that is unlikely. This car is like a bad drug habit. It is taking all my money and time, my family are concerned, but new mods just feel sooooooo good. nah had it assessed previously. I will insist they they change it out regardless. Location: Somewhere on Earth, at the moment. Glad i found this thread re. the SCV ! 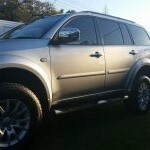 My 2008 2.5ltr Triton has /was playing up for about 12 months, it got to the stage where it was nearly un drivable ! all the symptoms listed in the last 7 pages ! took it to a mechanic who dissembled the manifold to find it was 75% full of carbon build up! had that cleaned out and a EGR blank plate inserted.This was done 5 weeks ago. Car drove like a charm until 2 weeks ago when the surging came back! Did a lot of research and spoke to a few people who narrowed it down to the SCV! bit the bullet on the weekend and followed the instruction from page 1 ( thanks for putting this up) took around two hours to complete! Gained access through the passenger side wheel arch, just jacked the front passenger side up till front wheel just touching the ground, removed the rubber flap and the CSV is located just behind the suspension spring, pretty easy to get to and remove. the biggest problem i had was removing the electrical plug, this took a good 20 min of gentle rocking back and forth! cleaned SCV and replaced, BUT i was told to re install it 180 deg. from how it came out !? did this and took it for a 100km freeway run on Sat arvo plus a few stop starts etc....The difference was chalk and cheese, more power, less fuel being used and NO SURGING!. On Sunday i added 300ml of 2 stroke non synthetic oil to the full tank, car much quieter and seems smoother. Anyway, thanks for this thread as its saved me a few $$$ by doing it myself! 2008 ml with 160000 on the clock. the only issue i had with mine ,at about 158000 was the surging. i did the 180, went well for about a month, then did the clean ,same thing, then bought a new denso scv for $135 on e bay . this has now been in for 1500km and it still feels like new. Dealer Quoted me over $400 for a new one. just saying , get a new one, they are cheap as to find . reset via scan gauge and no issues. but it seems to come on when I don't have the AC on ? aimstix wrote: Might sound like a stupid question but how do I find and remove my scv? My triton has been running rough sporadically and I have changed the fuel filter a few times thinking it would solve it.. and these sound exactly like my symptoms. 3.2 just jack up left hand side take off wheel take off rubber flap things and bingo there it is behind spring. You won't need a retune if you replace or clean the valve, its under ECU control. How old is the valve? If its under 50k, just give it a clean and polish the plunger if scuff marks are visible. Stick a 300ml dose of 2Stroke in a see if it frees up, can't hurt. ( just like aspirin for diesels ). Thanks, Triton has 145k, and no indication of SCV replacement in known service history so it's probably original. Is that 2-stroke oil, or 2-stroke fuel mix Will give it a try, cheers. 2 stroke oil, and add with a full tank of fuel. Better to be silent and thought a fool than open your mouth and remove all doubt. Just the 2 stroke oil - don't add any petrol.